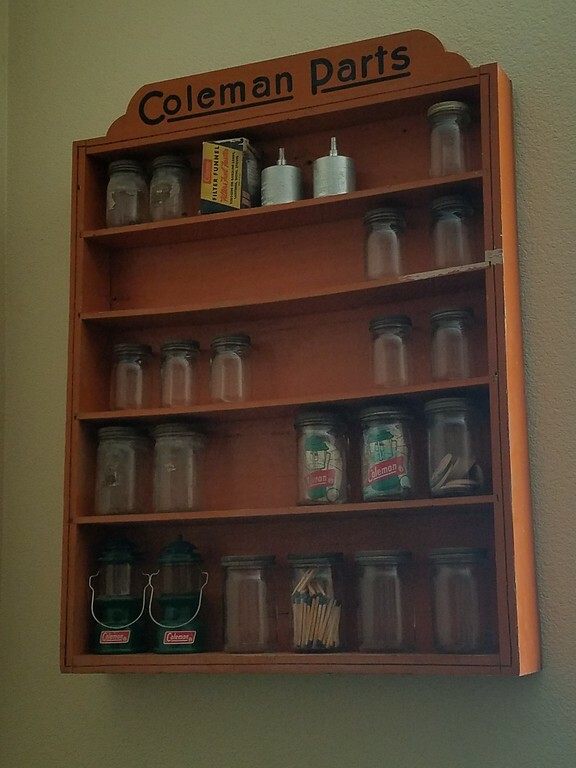 Old Coleman Parts Online Store > Categories > Collections: Restored Pieces and Before & After Projects > Parts Jar Display Question. My wife won this on a local online auction. Multiple bids but she was determined to get it. She did the bidding last Thursday during our bowling league, between frames. We picked it up Saturday. What years were these sold to dealers? Won what? Got any pics? Really nice orange wood parts rack. I have one too, but unsure of age. Here is a pretty good article about them, but its in japanese....im using google chrome browser and it pops up if i want to translate to english. The five shelf orange painted wooden parts rack was first produced in late 1944 and was for sale in 1945. The price for the five shelf rack with 36 jars in 1945 was $3.95 without parts. Dealers could buy any or all of three parts assortments separately. The entire set of 3 was about $51. Gummed labels were sent when parts were ordered. (BTW, the part numbers and descriptions were hand typed in house). I got this information from Herb Ebendorf, himself. About 1952 maybe 1951 Coleman marketed a four shelf orange painted wooden parts rack (#199-355) with 23 labeled jars AND parts. This sold for about $29. The four shelf rack was short-lived. Hence very few have survived. Congratulations on a great find. These often ended up "at home" with the sign removed (nailed on with finishing nails) and repainted to hold bric-a-brac or S/P collections. Thanks for sharing both the photos and the info. Thank you everyone for the information and history lesson. The above image in my original post is of the display rack after I cleaned it up a bit. The below image is how it looked when we went to the auction site to get it. It was nailed to the wall studs of work shed. It took me nearly an hour to remove it without causing any further damage.